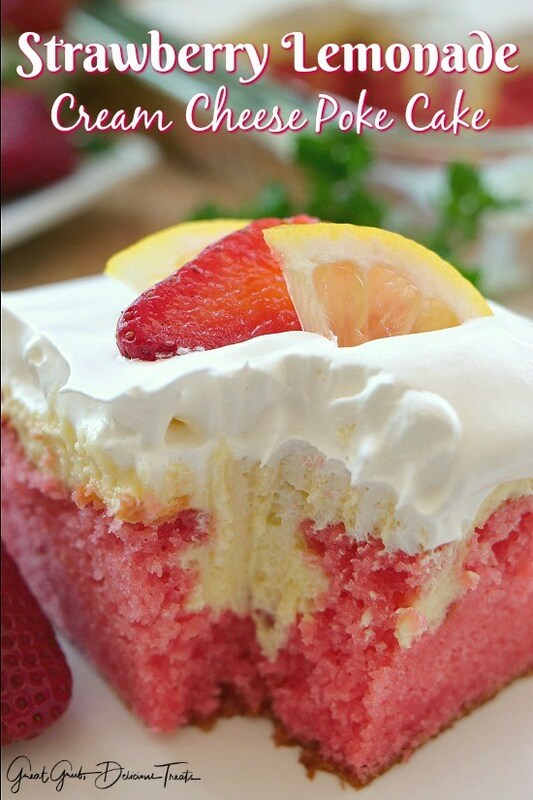 Here’s a delicious strawberry lemonade cream cheese poke cake that is perfect for spring and definitely perfect for a refreshing summer treat. This cake recipe uses my extremely popular cream cheese lemonade pie filling so you know it has to be delicious! Strawberries and lemons, two great flavors in one awesome tasting dessert. The flavor of the strawberry cake, mixed with the tart, delicious, lemonade cream cheese filling, then topped with the light and fluffy cool whip, makes this one incredibly delicious dessert that will be requested over and over. Let me just say, the first bite will have you hooked. Preheat oven to 350° and spray a 9 x 13 glass baking dish with a non stick spray. Set aside. In a large mixing bowl, beat cake mix, jello, eggs, oil and water until well incorporated. Pour into prepared baking dish and bake for 39-42 minutes or until tooth pick inserted comes out clean. While cake is still hot, poke holes with the end of a wooden spoon all over the top of the cake. In a medium mixing bowl, beat cream cheese for 3 minutes on medium speed until creamy. Pour lemonade concentrate into cream cheese and beat until well blended. In a small mixing bowl, beat evaporated milk and pudding mix for approximately 45 seconds. Add pudding mix to cream cheese mixture and beat until well incorporated. Spoon some of the lemonade filling mixture into a sandwich baggie and cut a small opening in the corner of the baggie. Squeeze filling into each hole and then spread the remaining filling mixture over the top of the cake. Cover with plastic wrap, chill for 4 hours and then top with cool whip and sliced strawberries and lemon wedges before serving. 0 Response to "STRAWBERRY LEMONADE CREAM CHEESE POKE CAKE"